1. Ave. 42 E: 308 acres with 18" well. Approved by County for a master planned community of 1200 units. Previously farmed. Well was tested in ADWR filing at 2 million GPD. Water and soil samples. Survey exists. 2. Ave. 42 E: 80 acres with 50% interest in the 12” well located on the parcel. (Additional 80 can be assembled if required, but not included in pricing.) Survey exists. 3. 80 acre parcel with 18" and 20" wells which have been scoped and flow tested. Has 100 year assured water supply certification from ADWR. 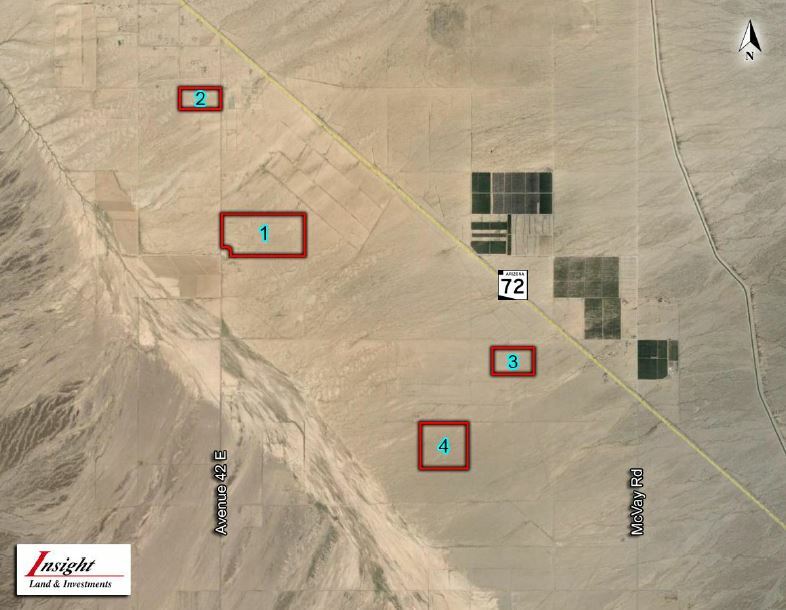 Approved for 5 DU per acre by ADWR, and County General Amendment Plan approval for 5 DU's per acre as well. Survey and geohydrology for 100 year water supply. 4. 80 acre parcel. Has 100 year water assured supply from ADWR. Geohydrology for 100 year water supply.